1. the deepest feelings; the strongest affections: to tug at one's heartstrings. How are you doing with your WIP, everyone who's joining me? Are the numbers adding up? Is the story making sense? I am doing okay with my 'Mechanics' fic, although I'm not sure where it's headed! Ha! But that's not new for me. I'm about 8K in, I think (2K added this month), so here's hoping I can keep up the momentum and actually finish it. Need some inspiration? I'm doing a photo challenge on FB currently, and today's prompt is 'HANDFUL', so see if that gives you something to be going on with on your WIP if it's useful. Monday is almost gone for me, but I want to hear how yours is going! It's a miracle - I actually remembered to post this! WOOHOO! My work went well today - I had been asked to help a trainer from another office work on a 25 year review (most of the ones I do are less than 10 years, but I love getting my teeth into these biggies! ), which he was struggling with, so it's been a day of getting everything in order, and then dealing with the simple part that we could do on our in-house calculator, but tomorrow is the hard part where we do the 'manual' part, pre-dating our current computer system, so I'm raring to go on that, and will be pleased if it gets done in the one day. 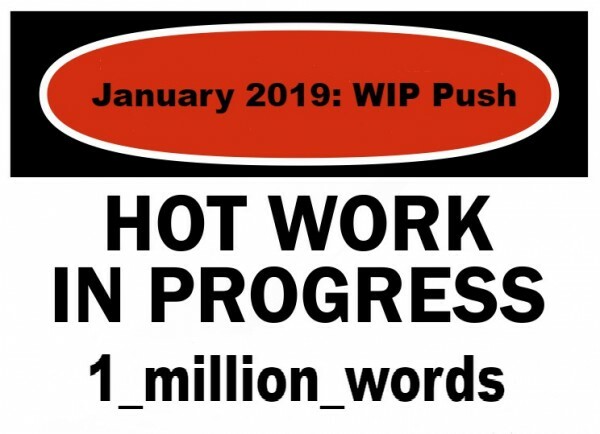 As for writing, I am getting there with my WIP - another 312 words today, and I'm 1000+ words over where I should be for the month, so yay! I feel like it's starting to come a bit more easily now, so am hopeful I can at least get a good proportion of it done by the end of the month, even if I can't actually post it by then. The rest of this week will be about that and writing current info in my new address book (I know; who even does that any more? Am I showing my age? Don't answer that. HA!). And by the way, I know we need 2019 counters, a new Weekend Challenge schedule and a few other tweaks to the main page and links. Bear with us as we go through things over the rest of this month!